If you want more information, please feel free to inquire here. If you want to set up a tutoring session, please provide your availability, some basic details about yourself/your student, and some information about what you seek from tutoring. Yes, please send me references. Teaching Bio. Trevor Kafka is a qualified instructor of the aerial arts who teaches classes insured through the International Special Events and Recreation Association (ISERA). 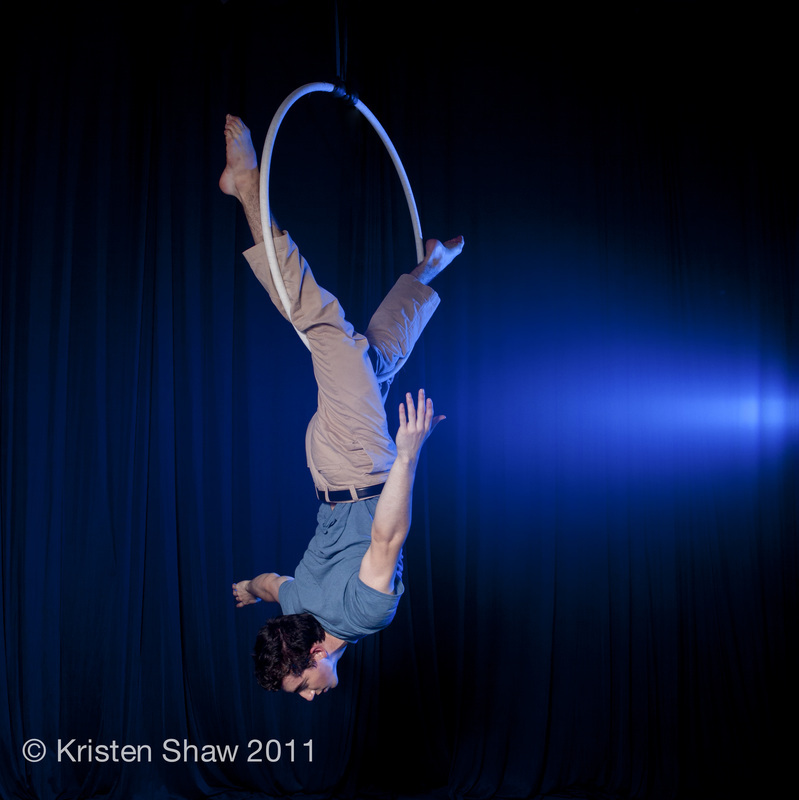 He received his initial training through the Aerial Fabric and Static Trapeze Teacher Trainings both led by former Cirque du Soleil performers Elsie Smith and Serenity Smith Forchion offered at the New England Center for Circus Arts, and has since continued to expand his teaching knowledge through staff training programs at the STREB Lab for Action Mechanics and Esh Aerial Arts. Trevor has mastered a broad aerial skill set as taught by former Cirque du Soleil performers Elsie Smith, Serenity Smith Forchion, and Ivo Georgiev, former Cirque Éloize performer Aimée Hancock, among others and has currently taught at numerous venues such as Esh Aerial Arts in Boston, MA, Long Lake Camp for the Arts in Long Lake, NY, Concord Academy Summer Camp in Concord, MA, World Cup Gymnastics in Chappaqua, NY, The STREB Lab for Action Mechanics in Brooklyn, NY, and the 2011 NYC-Regional American Youth Circus Organizaton Festival at the Circus Warehouse in Queens, NY. Proper Attire: Clothing that will not impede range of motion nor flip up when inverted is ideal. Keep in mind to cover the armpits and backs of knees. Long hair should be tied back and clothing must not have zippers or metal buttons that can damage any aerial apparatus, and is inclusive of jewelry and watches (eyeglasses are okay). As appropriate, supportive undergarments are also recommended. Be sure to check the Calendar for any schedule irregularities. You can always email Trevor at circus.trev@gmail.com for confirmation on any lesson. Preregistration is required for all classes (please try to do so at least 48 hours in advance). Sign up online for all classes at Esh Aerial Arts by emailing Victoria Quine (Esh Aerial Arts staff) at scheduling@eshaerialarts.com. If you wish to invite Trevor to come teach at your location, please email him at circus.trev@gmail.com to discuss details and rates. Cancellation Policy: You must cancel at least 24 hours in advance to do so without penalty (you will otherwise be charged the full price). If Trevor needs to cancel class, you will both be notified as soon as is humanly possible, as well as will receive a complete refund for anything prepaid. General availability: All day on weekends and some availability on weekdays (email circus.trev@gmail.com for more info on this week's availability). Lessons can be anywhere from one hour to two hours long. Scheduling is on a class-by-class basis, so be sure to inquire about the time that works best for you! Who can attend: Eight students maximum. Classes open to beginner through advanced students. Class typically starts with 15 minutes of stretching/warmup, and then uses the rest of the time for aerial skill-building, sometimes ending with conditioning for an added challenge. Other class formats available by request. Discounts: Anyone who reserves two or more hours of lessons at once receives a 15% discount! Mixed Apparatus private/semiprivate lessons at the STREB Lab for Action Mechanics (S.L.A.M.) in Brooklyn, NY. Aerial Hoop pictured above. General availability: Weekdays 3p-4p and 8p-9p. Who can attend: Four students maximum. Classes open to beginner through advanced students. 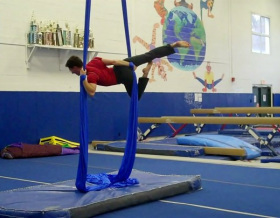 Description: Custom-built aerial classes tailored to the abilities and needs of each student. Trevor teaches a wide variety of aerial fabric skills from basic footlocks and wraps to advanced drops and rolls. Class typically starts with 15 minutes of stretching/warmup, and then uses the rest of the hour for aerial skill-building, sometimes ending with conditioning for an added challenge. Other class formats available by request. Rates: 1 student - $50, 2 students - $35 each, 3 students - $30 each, 4 students - $25 each. Discounts: First-time aerial students receive a full-hour free trial lesson! Anyone who reserves two or more lessons at once receives a 15% discount on both! Note: Similar lessons also available at the STREB Lab for Action Mechanics in Brooklyn, NY (see class 5). Contains updates on Trevor's teaching schedule, information about classes and new teaching locations, students looking to share lessons, special lesson promotions, as well as upcoming performances and other events. Asterisks indicate required fields. TENTATIVE Session Class: These classes are currently in consideration for sign up in the fall. All classes 60 minutes each for six weeks, providing a consistent training group and set of training times. Each six-week session costs $120 per student, 3-4 students. Ages 10-18. If this sort of class would be of interest to you/your child, please let Trevor know. Summer 2011 schedule: TBD Check back soon for more information! Lessons are available in one, or multiple aerial apparatuses. You may reserve your time slot for your private/semiprivate or keep it open for others to join in as well.